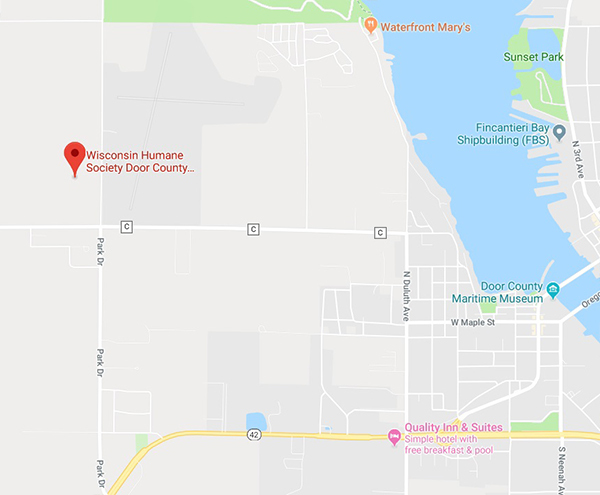 The WHS Door County Campus is temporarily closed for adoptions as we assist other shelters in quarantining 25 new arrivals. More information on the situation can be found here. Our staff is currently focused on helping the dogs settle in, and we will resume adoptions as soon as we’re able. We are still taking in stray and surrendered animals as usual, as well as donations. Right now we are in desperate need of paper towels, dog toys, Kongs, small treats, and baby wipes. You may drop off donations any time between 7:30 am - 7 pm. If you are interested in volunteering, please email Cassi at cwend@wihumane.org. Thank you for your support and patience during this time! We recommend that you arrive at least an hour before we close in order to complete the adoption process. *If you are bringing an animal to WHS, please call us in advance at 920-746-1111 to make an appointment so we're better prepared for your animal's arrival.